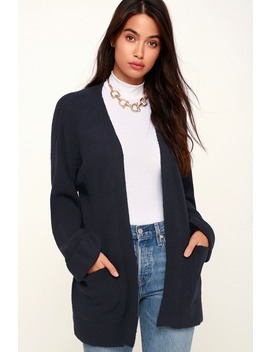 Cozy up with a cup of tea and the Olive + Oak Donna Navy Blue Open Front Cardigan! Relaxed, lightweight knit falls from a collarless neckline, into an open front bodice with patch pockets. Cuffed, bell sleeves with drop shoulders add a trendy, laid-back finish.